Until Bradley Prairie School was founded at Burke in 1885, the only school in the Burke area was at Ryan Chapel Methodist Church. Ryan Chapel School began operation before 1870 and continued in operation until 1907. Many early students attended both schools, and several teachers taught at both. 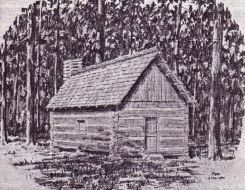 Raymond Ryan, Drawing of "First Building"